Dishwasher Detergent got you Down? In 2010 Panic erupted across the greater United States. Millions of households began pulling out supposedly “clean” dishes from their dishwasher still covered in spots and food particles. Many tried to pinpoint their enemy, fiddling with dishwasher parts, trying different cycle settings, and even buying an entirely brand new piece of machinery. What so many failed to realize was that the true nemesis to clean dishes lay within their detergent itself. Since then, it was uncovered that a single component of commercial dishwasher detergent was making all the difference between a spotted, muddled glass and a sparkling crystal clear glass. Believe it or not but phosphates are the dishwashing game changer. That is why Cascade with phosphates is the tried-and-true king of all dishwashing detergents. Hundreds of reviewers have come to this very same realization and are raving over the quality results they have seen in Cascade with phosphates dishwasher detergent. The phosphates latch on and directly remove stains and all those stubborn and pesky food bits. Phosphates are proven to be more effective than any other ingredient in dishwasher detergent, thus giving Cascade with phosphates the edge. 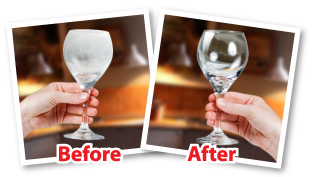 Tests have proven that Cascade with phosphates not only cleans better but gives glass and dishware more shine than any other leading competitor. Previous Post Back to School Shopping Starts Now!